Hello there! I am a twenty-one year old girl from Sydney, Australia! During the day, I'm a hard-working student trying to make it into the corporate world, a health/fitness fanatic, foodie and by night I'm a cosmetic/beauty enthusiast, a youtuber-holic and big time animal lover. For the past year or so, I've only been blogging on particular occasions - so if you've been a long time follower of my blog, you may have noticed the infrequency of my posts. Created in September 2011, Beauty Blogging has become an additional hobby to me, as I’ve had many blogs in the past and also being inspired by most famous beauty bloggers on YouTube. My passion for cosmetics; is something different and exciting for a change. I got into the idea of sharing my passion and also giving my ideas and tips, reviews to fellow bloggers, friends and family - as well as gaining some knowledge in beauty along the way. I am also a member of Beauty Bloggers Australia, Australian Beauty Bloggers as well as the Make Up Social. For all PR enquiries (Sponsorship, Media Kit or Reviews) I have put them on hold for the time being due to the infrequency of my presence on the blog. My Top 5 Things on my Christmas Wishlist! 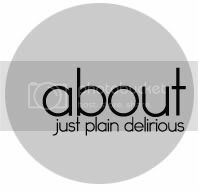 All Rights Reserved 2011-2012 - Just Plain Delirious. Powered by Blogger.